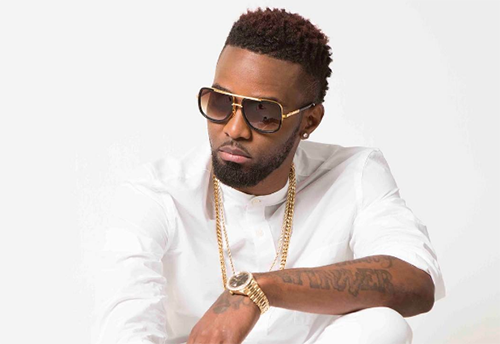 Admittedly, dancehall star Konshens has been MIA from the local scene, but it seems that’s been for a very good, shall we say, splashing cause. Sure, that didn’t quite make any sense, but you’ll get that reference soon, probably. Okay, here’s what we found out – apparently, Konshens has been hitting way above his weight and has been rubbing shoulders with some heavy hitters. Who might those be? Well, does the name ‘Curry’ ring a bell? No, not the spice. THE Curry, Steph that is. The Splash King (Get the reference now?) If you’re still struggling to get it, we’re talking about basketball superstar and the greatest shooter the game of basketball has ever seen, Steph Curry, also called Chef Curry. Yes, good people, get a taste of this Curry! Apparently, wife of the famed basketball star, Ayesha Curry, recently had a surprise birthday party thrown for her by her hubby, and just who did the power couple invite? None other than Mr. ‘Good Girl Gone Bad’ himself, Mr. Konshens. And make no mistake about it – the party was star-studded, and included the likes of Gabrielle Union, Tamera Mowry, Jessica Alba and Mia Wright, just to name a few. In that room full of stars, we’re hearing that Konshens shone. Oh, he wasn’t the only invited dancehall star, either. Also partying with the heavy hitters was Hood Celebrity. I’m sure we don’t have to say more at this point, but we will. In a word, the party was LIT (‘off the chains’ for you old folks). Why a Jamaican-themed party? Well, Jamaica’s influence is practically everywhere, but we learnt the reason went far beyond our culture’s welcomed pervasiveness. It was revealed that Ayesha Curry’s parents are of Afro-Jamaican and Chinese-Jamaican descent, and from all indications, the mother of three is no stranger to Caribbean (ahem, Jamaican) culture! Videos of the lively birthday celebration were quite naturally all over social media, and you could see clips of the Curry’s getting down to some good old dancehall music, and were more so into it when Konshens took the microphone, and was joined by Hood Celebrity. It’s a good thing they delivered, as comments like these from Ayesha’s superstar friends made it all worth it: “Happy Birthday Ayesha,” Gabrielle Union wrote on Instagram. “So glad we could sneak up to the Bay and surprise you! S/O to Steph for keeping her laughing and smiling and on the dance floor all night and that bomb food!!! Good times!! Until the next adventure…,” she added. The others all hit right in that neighbourhood. It was good on our musicians to represent, and hopefully, these connections are being capitalized on. Happy belated, Ayesha!